Exchange traded funds tracking aerospace and defense stocks have been among the best-performing industry ETFs this year, a theme some analysts see continuing. The iShares U.S. Aerospace & Defense ETF (NYSEArca: ITA), PowerShares Aerospace & Defense Portfolio (NYSEArca: PPA) and the SPDR S&P Aerospace & Defense ETF (NYSEArca: XAR) have been one of the steadiest “Trump trades” and have been recently been making a series of record highs. ITA is a cap-weighted ETF, meaning it has larger weights to big-name defense stocks, including Dow components Boeing (NYSE: BA) and United Technologies (NYSE: UTX). XAR is an equal-weight ETF. PPA holds 50 stocks “involved in the development, manufacturing, operations and support of US defense, homeland security and aerospace operations,” according to PowerShares. Boeing and United Technologies are two of the best-performing stocks in the Dow Jones Industrial Average this year. “We acknowledge that Defense stocks have had a great run in recent years, though are unwilling to call an end for three primary reasons: 1) The optics around a high threat environment that are likely to continue given headlines around North Korea, Russia, the Mideast and so on; 2) Budgets are clearly expanding over the next few years as evidenced by recent traction into 2016/2017, and even under a sequestration scenario, with upside potential via a more functional political backdrop (e.g. tax reform for a ~30% tax payer); and 3) These drive a total return of ~12%, consisting of ~10% annual EPS growth and ~2% dividend yields, which should sustain relative valuations,” according to a Morgan Stanely note posted by Teresa Rivas of Barron’s. Aerospace and defense stocks are part of the broader industrial sector and have been important drivers of the sector’s performance over the past year. In fact, aerospace and defense names have been industrial leaders. Year-to-date, investors have added $1.32 billion to ITA while PPA and XAR have seen combined inflows of almost $300 million. 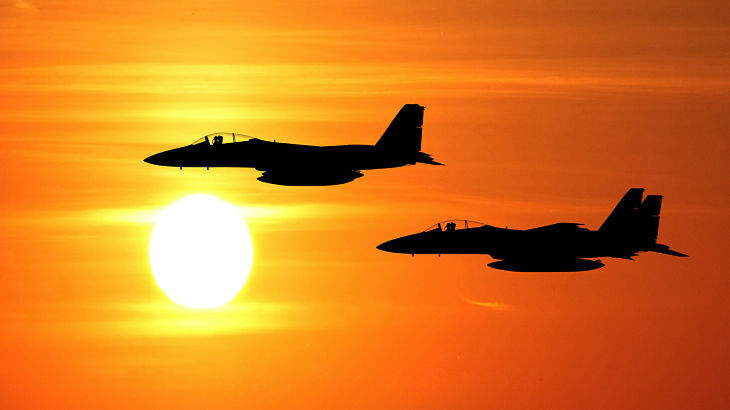 Aerospace and defense ETFs have also been bolstered by the likes of Lockheed-Martin (NYSE: LMT) and Raytheon (NYSE: RTN), stocks that can be found in the aforementioned ETFs. “We view LMT as a well-balanced bellwether that strikes the right balance between robust segment margin growth (~50bps annually), multi-decade revenue visibility, and a leading 5-year EPS CAGR of ~15% that puts us above consensus, all underpinned by the F-35 ramping 2-3x over the coming years along with pension benefits. For RTN, its leading positions internationally and in high- demand areas like missiles defense, in conjunction with undervalued optionality around an A-rated balance sheet, create a favorable set-up,” according to the Morgan Stanley note seen in Barron’s. For more information on the defense industry, visit our aerospace & defense category.